My dad just sent this picture to me. I'm done laughing now. All I could think of was "Randy" in A Christmas Story not being able to put down his arms. 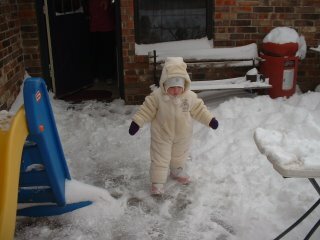 I think she's wearing like 3 pair of pants and two shirts PLUS that snowsuit. Poor Ethan looked like a bubble. I just wish I had his picture to show you. He refused to let it be taken. Smart boy. He knew I was going to put it on the internet. What a cutie! And the snow? You can keep it, tyvm. Makes you wonder just what's going through their heads! "I'd like to play in the snow, but I can't get close enough to it with all these layers on!" All together now: Awwwwww. That's so cute. Did you kids make snow angels? If they did, I'm sure they looked just like you. LInda - Yeah!! She's a cutie all right... and I think she knows it!! As for the snow - I don't want it either!! Shaken - Oh... we knew what was going thru her mind all right. She let us know that she "don't LIIIIIIKE it!!" Maid - Thanks!! I'm kinda partial to my kids and think they are pretty darn cute. But I don't think I'm supposed to tell people that I think my own kids are cute.. Am I? 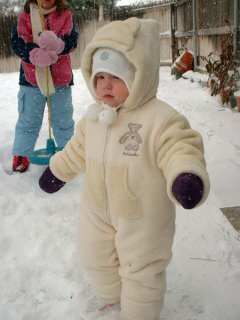 awww...that snow suit is too cute! Man, christmas is my favorite time of year just becasue of that movie.